PASS Summit 2014 Here I Come! 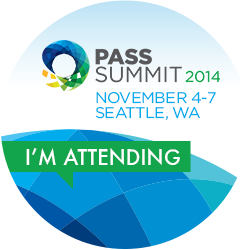 I am fortunate again this year to have the opportunity to attend the PASS Summit conference. Big huge thanks and shout out to my current employer (Silver Bay Realty Trust Corp) for sending me. This will be my 3rd time attending and coincidentally all three of my visits have been to Seattle, WA which is great because Seattle is a very fun city to visit. If it’s anything like my previous visits, it should be a great conference filled with a lot of great learning and networking opportunities. Hope to see you there! This entry was posted on October 16, 2014 at 9:14 pm	and is filed under Events. You can follow any responses to this entry through the RSS 2.0 feed. You can leave a response, or trackback from your own site.